A Jersey minister has refused to comment on the suspension of the chief officer of the island's police force. Graham Power was suspended last month after concerns about the police inquiry into historic abuse at the former Haut de la Garenne children's home. Home Affairs Minister Andrew Lewis read out a statement to the States, but requested members refrain from asking him to reveal investigation details. States members then went into a secret session. Mr Lewis said very little information could be revealed at this stage. 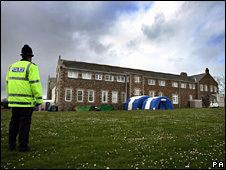 Mr Power was suspended after a new police inquiry team said no-one had been murdered at Haut de la Garenne. The former children's home hit the headlines in February when officers said they had found what was believed to be part of a child's skull and launched a murder investigation. It later turned out to be a piece of coconut. At the time of Mr Power's suspension Mr Lewis said some aspects of the inquiry had "not been conducted properly". Mr Power has strenuously denied any wrongdoing.